Painting can become a tough work in humid areas whether it is interior or exterior paint job. 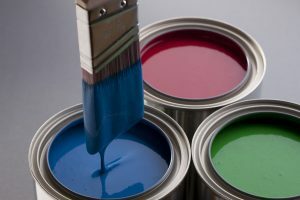 Water-based paints do not dry quickly due to high moisture level in the air resulting in the paint getting contaminated by dust and drips. Another flaw is that moisture gets trapped in the paint coating and causes the paint to crack or bubble up when the paint dries up. Humidity also creates a problematic situation while spraying; it gives the paint a milky appearance known as blushing. Designers and professional painters highly recommend not painting on a wet day. They will tell you to wait for a dry day to color your walls. But, improvisation is necessary if you live in a rainforest or in humid climate weather; where it’s always misty. You may need to use a dehumidifier or a heater, and in the case of solvent finishes; use a retarded thinner that slows the evaporation rate. Here is a guide to tell you about both the finishes in humid areas. Humidity slows down the evaporation rate of water-based finishes so you need to keep in mind about the falling temperature which may cause the water to condense on wet paint. In humid areas, you should stop yourself from painting in the late evenings. The evening is the time when the temperature starts falling, and a combination of cold and humidity will lead to dew formation that will ruin your paint. You should probably look to paint in the late mornings when the temperature is going up. You should start from the surfaces which have already been exposed to sunlight and are warmed up. As the sunlight reaches the different parts of your house, you shall move with it respectively. The key to paint outdoors is that you need to paint in thin coats which will dry quickly and save you from elongated hard work. If you are working indoors, then you will need to create a breeze by the spreading fans all across the room. You should also place a dehumidifier take out the excess moisture from the chamber. Securely position box fans in open windows to extract the paint fumes and moist air out of the room. If you have an air-conditioner in your room, then turn it on the heat mode to dry the space faster. Remember to paint thin coats. Due to many problems the use of solvent-based finishes is limited indoors, but they are still an excellent choice for exterior surfaces. Also, you can use the solvent for painting or finish furniture. The surface you are about to paint should be sanded to make sure it’s dry. To check whether the surface is dry, try to blow the dust off the wood quickly. If you cannot do it, then wait for the surface to dry. If you are looking to paint any accessories, then clean it with a cloth and check the rag for dampness. Again, paint in thin coats, so the moisture doesn’t leave its mark on the paint. Add a retarder such as shellac to light spray finishes preventing them from clouding. The retarder slows down the evaporation rate giving sufficient time to films to develop.